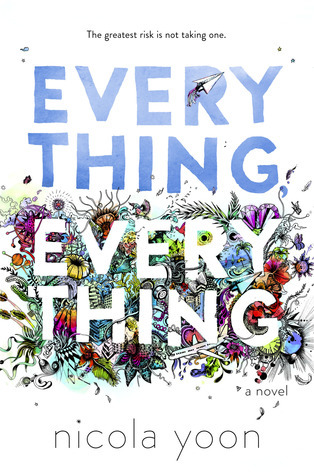 In her debut novel, Nicola Yoon’s Everything, Everything brings to light the importance of choices and the beauty which is life. A heartfelt story of trials and suffering, Yoon’s novel utilizes the beauty of language and the fun of imagery to convey to readers what is really happening inside the mind of Madeline “Maddy” Whittier, our main “bubble-girl” protagonist, and how she overcomes the obstacles life has given her. Will Maddy begin to find the true meaning of living? This is my first Nicola Yoon novel, which I had no idea this book was published 2 years ago! Funny thing, when books randomly become popular after so many years of already being published. I’m trying to open up to having more contemporary coming of age books in my reading repertoire, since I apparently focus on reading older coming of age novels. The question is…was it worth the read? This novel is absolutely adorable, full of delightful little images and references to books that booklovers will truly appreciate. Yoon grabbed my attention right from the beginning of the novel, introducing our witty and highly optimistic Maddy in the funniest way possibly despite her circumstances. The story, the characters, the additional little unique facets that make this book special…Everything, Everything is a extraordinary read with a grand amount of insight regarding how life works and taking things in stride. 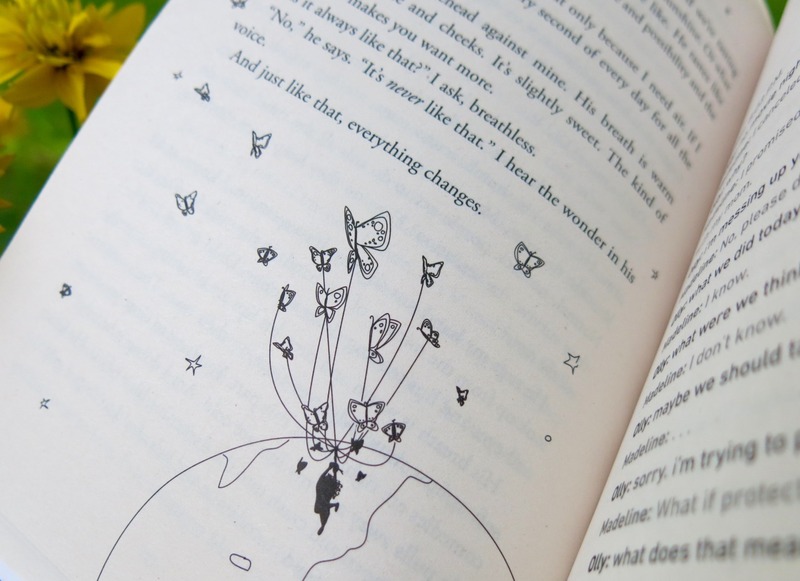 The story follows Maddy, a girl who is basically allergic to the world – how depressing! Truly, she is stuck in a white room with white walls, leaving the colour of her books to be the only colourful thing in her room. The house is set up to basically destroy any little parasite from coming into the vents or windows, and she hasn’t left her home for 17 years. Then comes in a boy named Olly, the bad boy who has the devilish grin and pretty boy looks. That’s the start of this remarkable tale. Yoon’s tale draws upon a variety of stories beyond Maddy’s, showing the life struggles people go through. We have family abuse issues, alcoholic problems, nerves with being gay, dreams pursuits, and the trouble of letting go – this is beyond all of Maddy’s mental and physical health issues that are discussed throughout the text. If you want a book full of different coming of age issues, you really should pick this up. Forewarning though my fellow bookworms, those who are not really into instalove…there’s instalove. At least it felt like instalove to me; it was hard to tell how much time had passed during certain sections of the novel, thus my statement on it feeling like instalove. That was the one of the few things I didn’t care for in this novel. The book layout’s just fantastic! Everything, Everything has regular first person narrative chapters, dialogue heavy chapters through IM messaging, images and charts, small little fruit for thought sections Maddy writes or blogs about, and so much more. It gives the text more character and richness to it, providing a change of pace and scenery for those who enjoy different types of reading styles. The writing style also gives you a closer connection to Maddy, feeling a part of her story and in her shoes rather than simply reading about someone. All in all, the writing style is incredibly cute and fun. Character wise, Yoon’s Everything, Everything introduces us to a handful of wonderfully diverse characters, each with their own struggles. It allows every reader to feel some sort of connection to at least one of the characters we meet. Maddy is a very loveable character, full of life though she has such little experience in the outside world. Through her books and the love of her family, she finds strength to keep going. Yoon does a good job of not making her unrealistically optimistic, showing Maddy at low points in events prior to and throughout the text. Olly is really interesting, fitting the stereotype of the dark bad boy but also surpassing that typecast. His character is full of mystery, with a rather bleak view of the world. But Maddy opens certain parts of himself up, and he’s able to gradually change his future on his own as well. There are some characters who completely threw me off! I was beyond shocked! Now that I look back, there are little hints throughout the story that show this character change, but I think Yoon meant for us to have a shock factor. Try and play detective if you’d like, but I think you’ll just have to read the book and find out yourself the crazy turn of events that occur later in the novel. The language…how beautifully poetic the language is! This has to be my favourite part of Everything, Everything! I’m a sucker for books that are language oriented. I just love the way people can phrase exactly what you’re thinking or attempting to express in a much more romantic and idealistic manner. Yoon’s notorious for this throughout the novel. Some people on Goodreads seemed rather offended by some of the points Yoon expressed in this novel…but I found them extremely relatable! For instance, Olly comments on how growing up may mean disappointing those we love. People were raging about this…but I totally understand this, and it’s something that shouldn’t be tossed aside. Here’s an example from my own life: I know my parents are proud of my new extension at my job, but I know my mom wishes I would move closer to home. Thus, I’ve disappointed her in some manner. Not because she isn’t proud, but she’s disappointed that we can’t be close. It’s thoughts like this throughout Everything, Everything that really made me have to sit back and just let those moments sink in – and this is only one example! Happy, nostalgic, peaceful, fearful, scary, anxiety, loneliness…Yoon brings attention to so many things, writing them in the most elegant and magical way possible. The on and off references to The Little Prince was divine, perfectly matching the thoughts and feelings occurring in this text. I know I’m biased, for this novella is one of my top stories of all time…but that’s okay. It was a brilliantly genius idea to have Maddy reference this book the most out of all the books she talks about. The concerns of love, the concept of death, Maddy and the Little Prince’s naïve natures…the two novels were meant to work with one another. All in all, Yoon’s Everything, Everything is a wonderfully written coming of age novel that sets the standards high for future books in this genre. It’s full of life, which is rather canny since Maddy has barely experienced life. If you enjoy coming of age novels and bookworm characters, I suggest adding this to your bookshelf! I was SO torn between giving it a 3 or 4 star. I was leaning to 3…but I just couldn’t. The ending was a little odd haha! I love the writing style! And thank you!!! You’re always so sweet!